Kerala’s seafood a favorite of Food Networks’ toughest critic. WASHINGTON, DC: Simon Majumdar is the co-writer of Dos Hermanos, one of the United Kingdom’s most widely read food blogs. He is also the author of two food/travel memoirs, Eat My Globe and Eating For Britain, and is currently based in the United States where he recently appeared on The Food Network’s The Next Iron Chef as a judge. 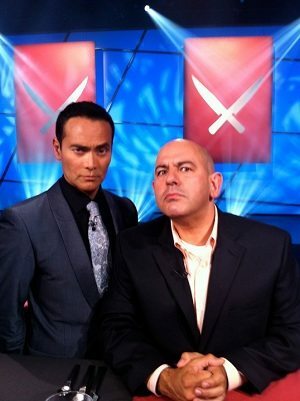 Simon Majumdar (right) with Mark Dacascos of the show Iron Chef. In three years, Majumdar has become a mainstay on The Food Network, appearing in numerous episodes of Iron Chef America, Extreme Chef, Best Thing I Ever Ate, and as a recurring judge for the past three seasons of The Next Iron Chef. For his second book, Eating for Britain, which was published to acclaim in 2010, Majumdar traveled throughout the UK to find out what British food — from Arbroath Smokies to Welsh Cakes to chicken tikka masala — reveals about British identity. The same year, he was selected as one of the three recurring judges for season three of The Food Network’s Next Iron Chef America. The show premiered in October of 2010 and led to over a dozen appearances on Iron Chef America as a judge and on Food Network’s Best Thing I Ever ate as a food expert. Last year, Majumdar completed his third season of Next Iron Chef and had also a recurring judge role on two seasons of the hit Food Network show Extreme Chef. What motivated you to drop a stable career in publishing to pursue a life as a food journalist? A lot of factors prompted this journey including the death of my mother (in 2004) and a mid-life crisis. On top of that, the job which I had been doing for a long time had gone from something I truly enjoyed to something which was becoming very stressful. The company I was working for was beginning to struggle and I had ended up spending more time looking at more spreadsheets rather than meeting with customers and putting books together both of which I really enjoyed. I reached a tipping point and I came to the realization that if I didn’t have something else to do that there was a good opportunity that I may not be around much longer due to health problems or something more sinister. It reached a crescendo one night and I ended up cooking which was something I always did when I was stressed. After cooking my favorite a family dish which is a red lentil daal, I found a notebook and wrote out my personal goals. One of those goals was to go everywhere and eat everything. That night provided the inspiration behind Eat My Globe. The next day at work I handed in my resignation notice. Within a few weeks, I was standing at Bondi Beach in Australia on the first leg of the journey! Where did your passion for the culinary arts come from? The passion for food and cooking is just deeply embedded in our family. My parents instilled in me not only a love of cooking but also a love for sharing food as well. A lot of our family conversations and heated debates seemed to be about food. Speaking of sharing what are some of your favorite Bengali dishes to prepare and share with others? Red lentil daal which incorporates many family traditions in its preparation definitely comes to mind. For example, from my aunty I learned to dry toast the lentils in the pan before I started cooking them and stir them with my finger. When the lentils got too hot to touch, she knew they were toasted enough. This is something I still do to this day and is quite entertaining for my guests! I also love “macha er jol” and “alloo posto”. I really love the simplicity of Bengali food. It has a lot of flavor but is not overpowering. I also have to admit I’m a big fan of Bengali deserts like “misti dahi”. What are your thoughts on Fusion food? Are your recipes inspired by your half Bengali and half Welsh background? I’m not a great fan of fusion food. I often think that fusion food is confusion food. In fact I think that there are very few chefs that handle fusion food particularly well. I love to try to recreate many traditional Indian recipes such coconut shrimp curry from Kerala or vindaloos from Goa. So my passion comes from not trying to make fusion dishes but rather recreating traditional dishes. You are a regular judge on the Iron Chef, Iron Chef America, Extreme Chef and you’ve earned the title of Food Networks’ toughest critic. How did you get approached to become a judge on some of the toughest food competitions on television and how did you earn the title of the being Food Network’s toughest critic? I am a great believer in serendipity and while I was traveling around the world, I met the most amazing woman who is now my wife who lived in LA (Los Angeles). We got married and I moved to LA and during that process I met someone who was a fan of my book who had a manager in TV and films. One thing led to another and we happened to get in touch with the people who produce Iron Chef just as they were putting together Season 3 and they were looking to fill the 3rd judging position. I went for a screen test 3 or 4 days before my wedding and later found out that the Food Network wanted me to come on board. A couple of weeks later I ended up filming on a beach in Malibu on my first ever set of American television. I was very fortunate to have been given the opportunity. In terms of being the “toughest critic”, I tend not to be terribly sympathetic. I don’t accept any of the excuses and I am very honest. I think it’s the Bengali in me to be critical of the dishes. But if the dish is really good, I am the first one to say it and I am the biggest supporter of certain chefs when I think they really get it and really value what they are doing. Although I am tough, I am not unfair. In fact I have become friends with a lot of the chefs that I have judged and they have subsequently said they respect my opinion. You have been on the show “The Best Thing I Ever Ate” on the Food Network. What is the best thing you ever ate? It changes every hour. There are so many dishes from all the countries that I have visited that it’s almost impossible to choose but if I had to pick a few, I would say the seafood in Kerala, crunchy tacos in Guadalajara, Senegalese fish and rice and Jamón ibérico in Spain. You are a critically acclaimed writer. You have earned the title as being one of the toughest critics on the Food Network. You have judged some of the most accomplished chefs from around the world. Where would you like to take your career in 5 years? I am working on my third book and it’s called Fed, White & Blue which will be coming out in 2014. It’s my journey to determine what it means to become a US citizen. I have put out a request on Facebook, Twitter, and my website where I have asked Americans to invite me to events, meals, to show me what it means to be an American. For example, working on farms or helping people make whiskey, brewing beer, fishing off the coast of Maine, meeting with Native Americans and learning about their food. Potentially we will be filming a pilot for it and I think people will be interested in it. The subtitle of my book is “Breaking Bread with America” and I think that once you share a meal with someone, nothing is ever the same between you and that person. Food has the ability to bring people together in spite of differing views and for me the only way I could discover America would be through its food.